White Oak Unfinished Stair Treads - Standard Box Tread - 1" x 11 1/2" x 36"
All our box treads (for a "closed-type" staircase) have a full round over bullnose along the front edge and are edge-glued for stability throughout the tread's lifetime. If you need a White Oak tread with a return, see left return White Oak treads or right return White Oak treads. Unfinished White Oak stair treads are sanded and ready for you to apply stain and polyurethane, we also offer prefinished White Oak treads with our UV clear-coat applied. Traditional White Oak stair treads are 1" thick x 11.5" wide x 36" long. These treads are sometimes identified by their part number - 8070 White Oak Plain Stair Tread. Order in larger quantities for a better price per tread and to save on shipping costs. What is the width of the traditional treads (white oak unfinished)? Also, I was planning to router my skirts to accept the treads and raisers...what radius is the nose on the tread? The traditional treads are 11 1/4" wide with a full round-over on the nose. Being a full inch thick, this puts the radius at 1/2" on the nose. Do you carry 10 1/2 " unfinished white oak treads or just the 11 1/2"? The standard tread depth is 11 1/2 it can easily be cut to your exact size requirements once you receive the product. 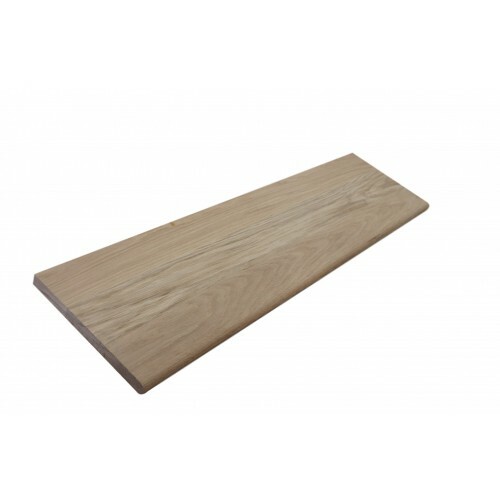 The White Oak 1 x 11 1/2 x 36 for $29.34 is an unfinished tread. We also do make the thick 2 in treads. If you are looking for finished product, we can finish both sides if requested. Please contact us at 1-866-429-0979 for a custom quote. Are riser boards available along with the tread? We do have risers available! The link below will take you to the matching risers. 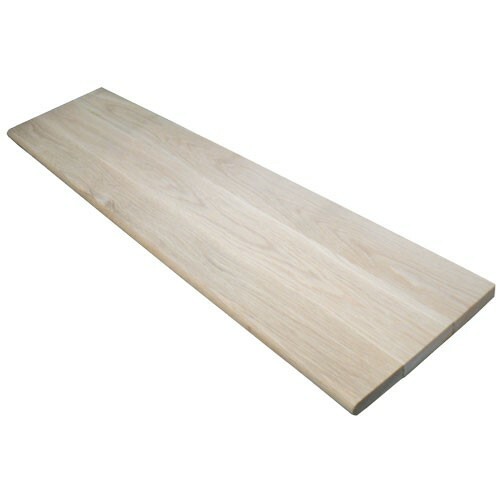 I am looking for a white oak unfinished stair tread 11 1/2" X 1" X 139". Can you fill this or know anyone who can? Thank you for your inquiry. We can make the custom tread you are looking for. We would be more than happy to put together an estimate for you. Please contact us direct at 1-866-429-0979 for a quote today.